It’s late afternoon. 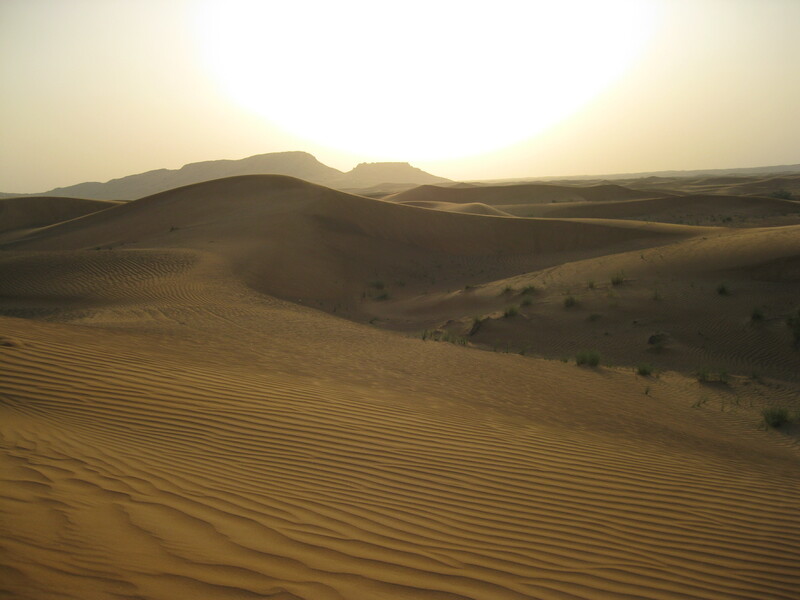 The sun slants across the dunes, throwing long shadows behind the sparse desert grasses. 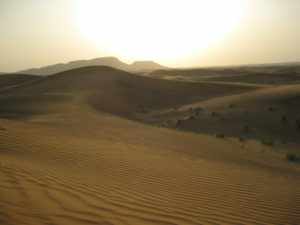 Everywhere there is sand, vast rolling hills of it, ridged and scored as if by the sweep of an invisible tide. We’re in a caravan of white Toyota land-cruisers. I’m wedged into the centre of the back seat, thrust backwards as the vehicle strains towards the top of a ridge, then hurled forward as it tilts over the crest, rolls sideways and plunges down. There are screams and expletives from my travelling companions. I’m mute with terror. In the driver’s seat, Ramzan is po-faced and silent behind his sunglasses. With one hand on the wheel, he steers us up and down the dunes. Ed Sheerin’s In Love With The Shape Of You blasts from a speaker behind me. Just an hour ago, Ramzan picked us up from our hotel. We sped down the freeway, through the sprawling outer fringes of Dubal, past scattered enclaves and occasional lone houses. We pulled in at a busy general store, the last outpost before the desert. My fellow passengers robed up – black abayas for the ladies, white robes for the men, checked headscarves for both. Later, standing on a dune, with my shoes full of sand, the sun burning through my city active-wear and my hair whipped into stringy threads by the scorching desert wind, I wish I had too. We pass camel farms, flimsy fences in the middle of nowhere and flat-roofed huts, but apart from us, there’s not another human in sight. With a sense of regret and relief we roll into camp. There’s a faded, sand-blasted look to it, but within its walls there’s shelter from the wind, shady corners and cool shadowy rooms. There’s a stand with cold drinks and tea. I make a beeline for it. Nearby a white-robed man is preparing shisha. I try that too. Next, I line up to hold a hooded falcon. Its wrinkled feet curl around my arm. Outside the walls there are more adventures; quad-biking, camel rides and sand surfing. I watch two bikers disappear in shower of spraying sand. I opt for a camel ride. It groans when it feels my 56 kilos on its back, staggers protesting to its feet and moans loudly as it takes a short circle around the carpark. I swear it gives an extra forward lurch as I dismount. 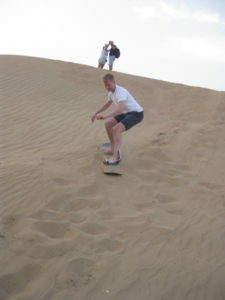 I head over the dunes to check out the sand surfing. The sun is setting now and an orange glow filters up from the horizon. Back inside, I sink onto the cushions at my stage-side table. On the left a couple of white-robed men giggle like schoolboys at the halfway point of a wine-bottle while their black-robed wives twitch and fidget over cans of red-bull. 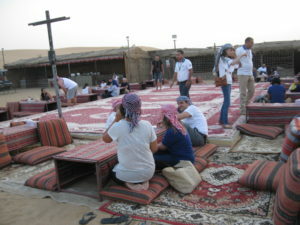 On the right a gang of lads in checked headscarves drag with concentration on sheesha and survey the scene through cool, narrowed eyes. We cue up for dinner – ladies on one side, gentlemen on the other. After the parched, monochrome desert landscape, the brightly-coloured dishes on the buffet (tabouleh, cucumber with yoghurt couscous, chicpea and rice, curries and kebabs, chicken, fish and lamb) are a welcome sight. Night falls. There’s a bright orange moon overhead and a scattering of stars in the dark sky. It’s showtime. To the beat of urgent drums and the clash of cymbals, a young man in heavy embroidered skirts whirls onto the stage. His skirts separate into layers. They light up. He peels them off layer by layer, revealing more and more with brighter and brighter lights, all the time spinning faster and faster on the spot, a master of control and balance. Later, he invites a trio of ladies to give the skirts a whirl. Their clumsy attempts highlight his mastery of the art. The music changes. A belly-dancer takes the stage. We all love a belly-dancer. There’s something surprising and delightful about her exposed flesh and sinuous movements in this modest culture. She shows her skill but doesn’t seek to flaunt it against the audience’s efforts. Thank goodness! The evening is over. The moon throws silver light across the car-park. Ramzan is waiting, a dark silhouette against his white Toyota. ‘Are we going on the dunes again?” ventures a timid voice. “Show us your night-driving skills” says a bolder one. But Ramzan is giving nothing away as he rolls out of camp. I must confess to a tinge disappointment when we turn onto a straight, sealed highway and speed towards Dubai’s distant glow. The desert safari is a quintessential Dubai experience. Do it with Arabian Nights.